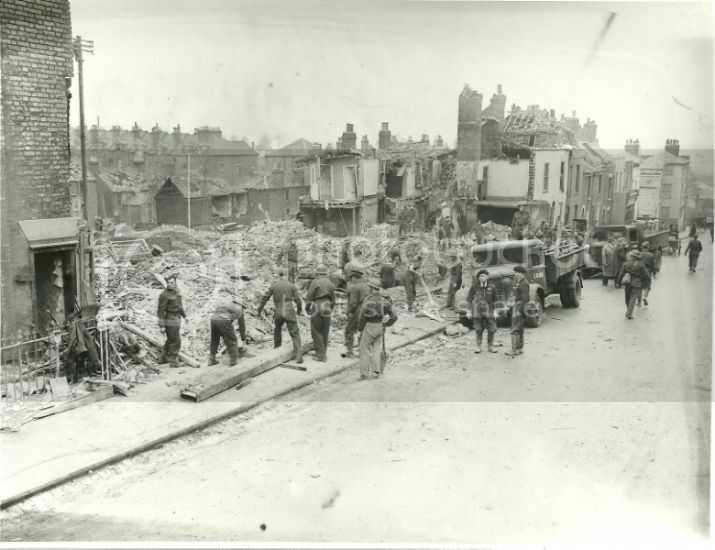 Hello there, I know this is an old post, but I'm writing the Euology for my Godfather - Colin Herbert, who was a six month old baby when he was involved in this bombing in Ordnance Street in December 1940. He was trapped under the rubble for six hours, in his mother's arms (she was Florence Herbert). Florrie had been half way down the stairs to the cellar when the bomb hit, she'd sent her older son, four year old Alan, down to the cellar before her when the bomb hit. Her husband Harry was at the top of the stairs. Their rescue was hampered by a raging fire, and in the process of putting this out, the little boy, Alan, drowned. My Auntie Florrie had serious hip injuries and was hospitalised for many months, her husband had an ankle injury. Baby Colin was unharmed. Writing this Euology, I wonder about the impact of this trauma. Colin Herbert lived a full life - he worked for the MOD, loved tennis, bowls, cards, he sang in the church choir and played the piano beautifully, he was an active member of the RSPB, but he never left his grandparents' house on Wyles Road in Chatham, where his parents had moved after their newsagents on Ordnance Street was destroyed in the bombing. Colin lost his father at 17, and lived with his mother for the next forty years, until she died in 1997, and then alone, for almost another twenty years until he had to move to a nursing home just over two years ago. He never married or had a life partner, and he didn't have any children. I wonder, but will never know, that if his mother hadn't lost her four year old son in such devastating circumstances, if Colin's life might have been different. His passing feels like the last vestige of war in my family, as we clear his grandmother's house in Wyles Road. After he died, my sister and mother were in this house looking for documents, and opened his mother's wardrobe (untouched since her death), at the back, behind a low shelf, they found a pair of little boys' shoes, that must have belonged to Alan Herbert. Colin Herbert's funeral is on Mon 17th Sept at 9.45am in Medway Crematorium, and afterwards at the Chatham Suburban Club in Wyles Road. Anyone who knew him, or who has a connection to this bombing, is welcome to attend. Jools Gilson, writing from Cork, Ireland. Very interesting - many is the time I`ve looked at that photo in the book 'Front Line County'. Things must have been getting 'noisy' that evening because I was half-way down our cellar steps in Ross Street, Rochester, calling to my mother to come down from the kitchen when there was that enormous 'whoomf' - or two, because there was actually two mines. My father was probably still at work in Chatham Gun-Wharf, not far away from the incident. I was 11 that year. My father (Steve Foy) lived in Ordnance Street - he was 10 years old when the parachute mine came down. When the air raid siren sounded on 14th December, 1940, he was playing with his friend, Jimmy Thorn at 26 Ordnance Street. My grandmother always insisted that my father returned home whenever the siren sounded and he did so that day and, in so doing, avoided the terrible fate that befell so many of the neighbours - his friend Jimmy included. My father (now 84) says that the parachute mine was a direct hit on number 26 - Jimmy's house. My father, his mum and sister all took shelter under the table at their house around the corner. Their house was damaged in the blast, but they escaped with nothing more than lots of cuts from the shards of flying glass. My dad tells me that the little boy in the photo, wearing a cap, and surveying the clean up operation is him. If anyone is still reading this thread, I thought you would be interested to know that after some correspondence and discussions between my father and the local paper and council over the last few years, there is going to be a plaque laid at the bottom of Ordnance Street, in memory of those who lost their lives. I'm told this will take place on 5th October 2014. If I get more details over the next few weeks, I'll share them here. Feel free to contact me about this. My Grandparents lived around there and they were buried for days in the Cellar, only water from a dripping pipe kept them alive. In the 60's my Nan would have tiny shards of glass break through her arms on occasions. That's excellent information and it's a very small world, my great great great grandparents lived less than half a mile from my house now in Maidstone, and until you posted that I didn't even know their names, let alone where they lived! I have extracted the names from the Commonwealth War Grave website of all civilians who died on 14/12/1940 and were buried in Chatham Cemetry. CASSON BENJAMIN 18 OF 41 FORT ROW. SON OF THOMAS AND THERESA MARY CASSON. DIED AT 41 FORT ROW. DOUGLAS IVY FLORENCE 33 OF 28 ORDNANCE STREET. DAUGHTER OF JOHN AND FLORENCE TOWELL, OF 90 COLEMAN STREET; WIFE OF SEAMAN OWEN DOUGLAS, MERCHANT NAVY. DIED AT 28 ORDNANCE STREET. DOUGLAS VERA ELSIE 15 OF 28 ORDNANCE STREET. DAUGHTER OF SEAMAN OWEN DOUGLAS, MERCHANT NAVY, AND OF IVY FLORENCE DOUGLAS. DIED AT 28 ORDNANCE STREET. HERBERT ALAN 4 OF 20 ORDNANCE STREET. DIED AT 20 ORDNANCE STREET. KENNARD GEORGE 37 FIREMAN, A.F.S. ; OF 18 ORDNANCE STREET. DIED AT 18 ORDNANCE STREET. MEREDITH EDWARD JAMES 40 OF 47 PRIEST DALE. SON OF JOHN FREDERICK AND MATILDA MEREDITH, OF 51 HENRY STREET; HUSBAND OF NELLIE MEREDITH. DIED AT 47 PRIEST DALE. SINCLAIR LOIS HELENA 44 OF 21 ORDNANCE STREET. WIFE OF S. SINCLAIR. DIED AT 21 ORDNANCE STREET. THORN AMELIA 33 OF 26 ORDNANCE STREET. DAUGHTER OF MRS. A. PAINE, OF 43 BEST STREET; WIFE OF JAMES THORN. DIED AT 26 ORDNANCE STREET. THORN JAMES 37 OF 26 ORDNANCE STREET. SON OF MR. A. THORN, OF 15 CLOVER STREET; HUSBAND OF AMELIA THORN. DIED AT 26 ORDNANCE STREET. THORN JAMES 9 OF 26 ORDNANCE STREET. SON OF JAMES AND AMELIA THORN. DIED AT 26 ORDNANCE STREET. WOOLVEN ROSA BLANCHE LOUISE 55 OF 22 ORDNANCE STREET. DAUGHTER OF CAROLINE CRUNDALL, OF 3 MILL WALK, BARMING HEATH, MAIDSTONE, AND OF THE LATE ROBERT BRUCE CRUNDALL; WIFE OF LEWIS HENRY WOOLVEN. DIED AT 22 ORDNANCE STREET. ZEDGITT EDWARD ANTHONY 26 OF 24 ORDNANCE STREET. SON OF PETER IGNATIUS AND LILIAN LETITIA ZEDGITT. DIED AT 24 ORDNANCE STREET. ZEDGITT LILIAN LETITIA 62 OF 24 ORDNANCE STREET. DAUGHTER OF WILLIAM AND MARTHA LACEY, OF WOOLWICH, LONDON; WIFE OF PETER IGNATIUS ZEDGITT. DIED AT 24 ORDNANCE STREET. ZEDGITT PETER IGNATIUS 72 OF 24 ORDNANCE STREET. SON OF PETER IGNATIUS ZEDGITT, OF VILNA, LITHUANIA; HUSBAND OF LILIAN LETITIA ZEDGITT. DIED AT 24 ORDNANCE STREET. I found this picture in my late fathers album, which shows a good view of some of the damage at the lower end of the street.I had to resize it, which has lost some of the details that could be enlarged in the original.In the background there are 2 small boys and a black dog taking great interest in the clear up. Try 'Civil Defence War Diaries' at the County Archives at Maidstone. Well, had chance to have a brief chat to my Mum about this and I got most of it right, date, location but it was her paternal Grandmother a Rosa Blanche Woolven that was killed. I will try and find out more as I told her about this site and she was very interested. The Grandparents lived in the houses that stood there next to a paper shop. She would have been 7 at the time. Is there somewhere online I can research the reports and casualty list? I have been told that my Aunt was living in Boundary Road at this time, looking after my brother while my Mother was away in a maternity home. Apparently she removed him from his cot shortly before one of the mines exploded, possibly because of the air raid warning, and on later returning to the cot found it full of broken glass where the window had been blown in. My other brother was born 11th December so the date fits. This must have been the mine that landed on the nearby open ground. It was where the parade of shops is now. I need to speak to my Mum about this. I remember being told as a child that her Aunt was killed by a mine attack in Ordnance Street. I will try and get as many details as I can. I always thought it was where the parade of shops are at the bottom on the left as you go down the hill towards the station. I assume I think that because I was told as a child but don't know for sure. I was told by one of my family that my Grandfather joined the Navy as a result of his Sister, Husband (an Irishmen) and their baby being killed in a bombing raid on their return from Ireland where they had been visiting relatives (I was told they lived in Ordnance Terrace) in December 1940. The rest of the family were attending a wedding when a neighbour informed them of the deaths. My Grandfather was Frederick Towell and I think his Sister was Ivy, although the information I have is very sketchy. Frederick (a DEMS gunner) was killed in March 1943 on board a merchantship which was torpedoed and sunk on its way back from New York, having previously been involved in the relief effort for Malta during 1942. Any information to prove or disprove this information would be greatly appreciated. My brother's wife's mum has written a book about her father during the war and in it mentions 2 parachute mines on 14th dec. The family lived in Ordnance St. She mentions the following.